One of the most readily available options besides the bookstore is actually nearby, also on the first floor of the Main Building. The OCCC Buy and Sell book board is next to the Main Building’s first floor elevator. The board has folders containing “for sale” and “wanted” cards for students to fill out and pin to the board. Information includes the book title, authors, course and section numbers, date of posting, and student emails. There also are many options available outside of OCCC. One of OCCC’s closest neighbors is Textbook Brokers at 7445 S. May Ave. This store is one location of a chain, but this location works specifically with OCCC students to give them the best buyback for their books, said Manager Brice Varbel. While books must be in good condition to be received, a larger variety of books are accepted by the store, including instructor and annotated instructor editions, international editions, and even the loose-leaf textbooks. While the loose-leaf books will only garner up to 20 percent buyback of the original price, they still are an option and an item the OCCC bookstore does not buy back. “We’re trying to give the students money for something that usually wouldn’t be worth anything,” Varbel said. One option offered by the store that OCCC’s bookstore does not is the ability to receive price quotes for buybacks by email. All that is needed for a quote by email is the book’s title and ISBN code, and within 24 hours a response will come for what the book is worth in buyback amount. “You would (want to) email us as much information as you can on the book,” Varbel said. “If you have the ISBN number directly off the book, that’s the easiest way to do it, because that’ll pull up all the information we need. “But if you can’t find the ISBN number you can just email us the title and author and edition. “If someone emails us, we give them mostly an estimate. It’s just a way for people to get an idea before they come in, like if they live far away, and they just want to get some information beforehand. For the tech savvy, the Internet also has many options. At the local level, Facebook offers a viable option. A Facebook page called “UCO/ROSE/OSUOKC/OU/OCCC etc text books and materials” is available for students to discuss selling or purchasing textbooks. Despite the title, the discussion is primarily between OCCC students. On a wider scale, students can use big websites such as Amazon and eBay. 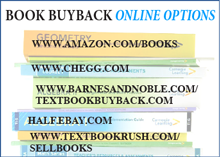 On Amazon, students can get up to 80 percent buyback on textbooks in their database. The drawback is, all buyback money is given back to the seller in the form of Amazon credits on a gift card. Students also can sell the book with a seller’s account and be paid outright. This includes books not listed in Amazon’s buyback database. EBay even has a specific website for selling physical media, including textbooks, called Half.com, which allows users to list a textbook instantly by entering its ISBN number. Much like Textbook Brokers, students can compare prices to get the best return on textbooks at www.bookfinder.com . The website boasts that a person can find books with just one search. “Since 1997, BookFinder has made it easy to find any book at the best price. Whether you want the cheapest reading copy or a specific collectible edition, with BookFinder, you’ll find just the right book,” the site reads. Users can search by ISBN or by author, title and publication year.